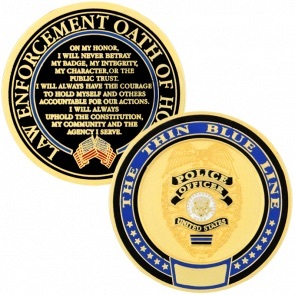 EPoliceSupply.com Thin Blue Line Police Challenge Coin: The Thin Blue Line is an internationally recognized symbol displayed in honor of fallen brothers and sisters. This commemorative coin features the law enforcement oath of honor on one side and a police officer's badge on the other. Coin diameter is 1.5 inches.